The JSE closed weaker on Thursday as it tracked other global markets lower, as concerns about a slowing global economy spread following the European Union’s economic growth forecast downward revision. Chinese equity markets remain closed however, the negative sentiment was evident in major European equity bourses as well as US equity futures which traded softer on the day. In the United Kingdom there was some significant volatility for the sterling pound during the Bank of England’s press conference following its decision to keep rates unchanged at 0.75%. The rand retreated further against the greenback as it fell to a session low of R13.63 mainly due to US dollar strength. The local currency was still trading near its lows at 17.00 CAT as it was recorded at R13.62/$. On the JSE, most of the blue chips were trading softer on the day. Retailer, Truworths International [JSE:TRU] fell 4.62% to close at R75.40, The Foschini Group [JSE:TFG] dropped 4.44% to R161.52, and Pick n Pay [JSE:PIK] closed 3.14% weaker at R66.25. Sappi [JSE:SAP] recorded another session of losses as it closed 3.83% lower at R72.83, while Clicks [JSE:CLS] lost 3.8% to close at R186.41. Aspen [JSE:APN] lost 3.21% to end the day at R142.19, and Sasol [JSE:SOL] dropped 2.87% to close at R411.51. Diversified miner South32 [JSE:S32] managed to gain some momentum as it closed the day 4.78% firmer at R35.49 as one of the day’s biggest gainers. Impala Platinum [JSE:IMP] gained 2.61% to close at R43.60 while Kumba Iron Ore [JSE:KIO] added 2.07% to close at R343.86. 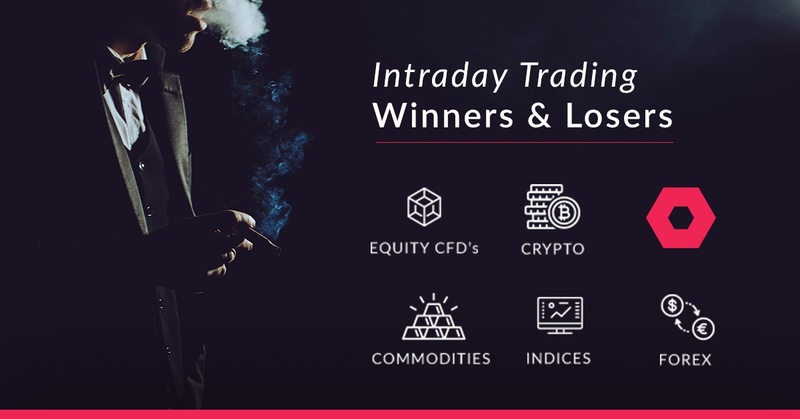 Intu Properties [JSE:ITU] climbed 1.7% to end the day at R20.90, and British American Tobacco [JSE:BTI] inched up 0.7% to close at R485.89. 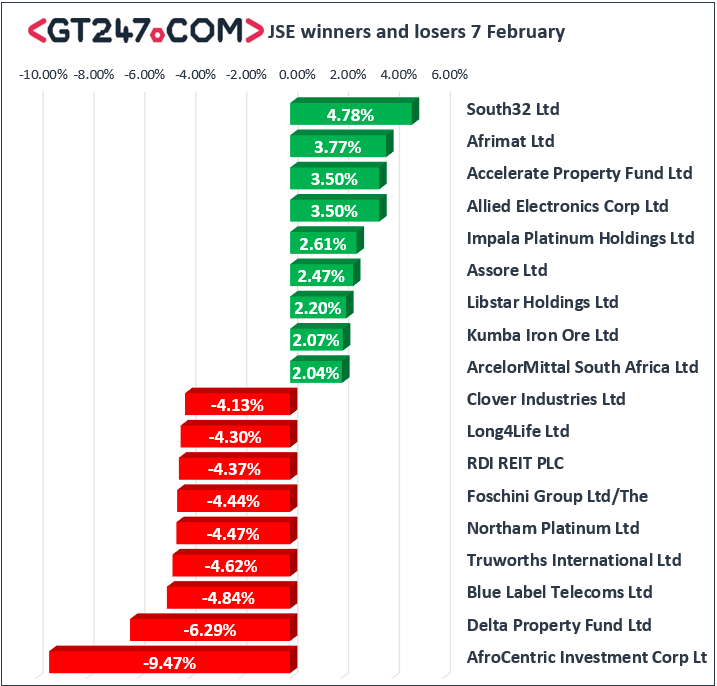 The JSE All-Share index eventually closed 1.17% weaker while the JSE Top-40 index lost 1.24%. All the major indices closed in the red in today’s session. The Industrials index lost 1.53%, Financials closed 1.48% weaker, and the Resources index shed 0.5%. At 17.00 CAT, Palladium was up 1.19% to trade at $1392.35/Oz, Gold was 0.26% firmer at $1309.99/Oz, and Platinum had lost 0.62%. Brent crude also pulled back due to the economic growth concerns in Europe. The commodity was trading 0.77% weaker at $62.21/barrel just after the JSE close. At 17.00 CAT, Bitcoin was up 0.19% at $3448.40/coin while Ethereum had lost 1.33% to trade at $106.26/coin.